Not to be confused with Rayleigh mixture distribution. 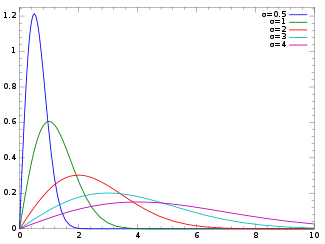 In probability theory and statistics, the Rayleigh distribution is a continuous probability distribution for nonnegative-valued random variables. It is essentially a chi distribution with two degrees of freedom. A Rayleigh distribution is often observed when the overall magnitude of a vector is related to its directional components. One example where the Rayleigh distribution naturally arises is when wind velocity is analyzed in two dimensions. Assuming that each component is uncorrelated, normally distributed with equal variance, and zero mean, then the overall wind speed (vector magnitude) will be characterized by a Rayleigh distribution. A second example of the distribution arises in the case of random complex numbers whose real and imaginary components are independently and identically distributed Gaussian with equal variance and zero mean. In that case, the absolute value of the complex number is Rayleigh-distributed. The distribution is named after Lord Rayleigh (/ˈreɪli/). which is the Rayleigh distribution. It is straightforward to generalize to vectors of dimension other than 2. There are also generalizations when the components have unequal variance or correlations, or when the vector Y follows a bivariate Student t-distribution. is the maximum likelihood estimate and also is unbiased.
. This is obtained by applying the inverse transform sampling-method. 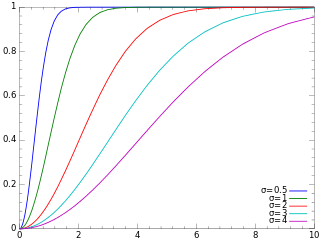 The Maxwell–Boltzmann distribution describes the magnitude of a normal vector in three dimensions. An application of the estimation of σ can be found in magnetic resonance imaging (MRI). As MRI images are recorded as complex images but most often viewed as magnitude images, the background data is Rayleigh distributed. Hence, the above formula can be used to estimate the noise variance in an MRI image from background data. The principle of Rayleigh distribution was also employed in the field of Nutrition for linking dietary nutrient levels and human and animal responses. In this way, the parameter σ may be used to calculate nutrient response relationship. ^ Röver, C. (2011). "Student-t based filter for robust signal detection". Physical Review D. 84 (12): 122004. arXiv:1109.0442. Bibcode:2011PhRvD..84l2004R. doi:10.1103/physrevd.84.122004. ^ Hogema, Jeroen (2005) "Shot group statistics"
^ Sijbers, J.; den Dekker, A. J.; Raman, E.; Van Dyck, D. (1999). "Parameter estimation from magnitude MR images". International Journal of Imaging Systems and Technology. 10 (2): 109–114. CiteSeerX 10.1.1.18.1228. doi:10.1002/(sici)1098-1098(1999)10:2<109::aid-ima2>3.0.co;2-r.
^ den Dekker, A. J.; Sijbers, J. (2014). "Data distributions in magnetic resonance images: a review". Physica Medica. 30 (7): 725–741. doi:10.1016/j.ejmp.2014.05.002. PMID 25059432. ^ Ahmadi, Hamed (2017-11-21). "A mathematical function for the description of nutrient-response curve". PLOS ONE. 12 (11): e0187292. Bibcode:2017PLoSO..1287292A. doi:10.1371/journal.pone.0187292. ISSN 1932-6203. PMID 29161271.